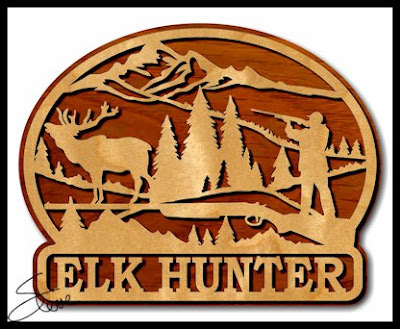 Elk Hunter Scroll Saw Pattern. Elk hunting sign. 10.25" wide. You ask for it. Here it is. 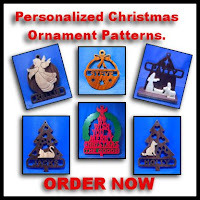 Everyone said I have waited too late in past years to start taking orders for the personalized Christmas ornaments. Now you have plenty of time to make as many of these ornaments as you need. I have three regular ornaments, two pet ornaments and one large door ornament to choose from. The three regular ornaments have an option to have the year on the ornament. On the Basic and Angel ornament the year is added to the bottom. The Manger ornament has the year on the backer board above the figures. Remember you only pay after you receive the patterns and are 100% happy. The link to make payment will be included in the delivery email. Credit card, check and cash are all accepted. This question come up every year when I do the personalized ornaments. On the door wreath the typical way it is done for the name Baxter is "THE BAXTERS". That one is easy. It gets tricky for names like Lewis. Here are the rules I follow. From a Google search and a few other sources including Grammar Girl and two major News papers. Never add an apostrophe. Season Greetings from the "The Smiths". If your last name ends with “s, x, z, ch, sh”, then add an “es” at the end of your name. Season Greetings from "The Joneses". If your last name ends with any other letter, just add an s. Season Greetings from "The Kranes". I don't care about these rules if you prefer it another way. When you fill out the order form just type what you want. Instead of typing Lewis, type "The Lewis' or The Lewises". Not that if you want the apostrophe it will add several more inside cuts. The apostrophe has to attach to the top of the cut out and that makes all the other letter touch also. 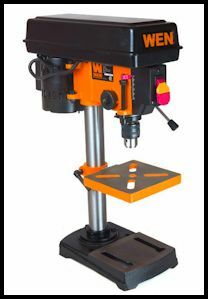 Swing: 8 inch. Motor: 120V, 60Hz. Horsepower: 1/3 HP.